A state-of-the art fitness center with free weights; universal machines; cardio equipment such as elliptical trainers, treadmills, stair stepper, and stationary bike; and a heavy bag. 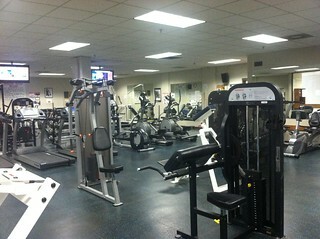 The weight room also features piped music and satellite television. Hours of Operation: Monday – Thursday: 8:00 a.m. to 9:00 p.m., Friday: 8:00 a.m. to 4:00 p.m.
GPSTC’s gym features a half-court basketball area open for recreational play during non-training hours. During training hours, the court is used for defensive tactics training. Also located on the gym floor, GPSTC’s agility area is devoted to Crossfit® training with power ropes, climbing ropes, a climbing net, TRX straps and medicine balls. For training purposes, the basketball court and agility area can accommodate up to two classes at a time and is often used for defensive tactics training sessions. Hours of Operation: Monday – Thursday: 5:00 p.m. to 9:00 p.m. and during daytime hours if no class is on the floor. The outdoor track and obstacle course includes a quarter-mile track for instructional and personal physical training programs as well as a 13-prop obstacle course used for agility and coordination training. Hours of Operation: Daylight hours, weather permitting and if not in use for a training class. Two padded classrooms serve as home to GPSTC’s defensive tactics and physical training blocks of instruction. Each room can accommodate 15 to 35 students at a time depending on the nature of the training. Hours of Operation: Open for training courses only. GPSTC’s pool is used for dive training only. Because the pool is not heated, it best replicates real-world water rescue operations. The pool features an underwater observation window and the potential for using sunken props and obstacle features that train students to perform underwater retrieval and search-and-rescue operations.